Bunkhouse & Farmhouse @ Llangorse0333 600 20 20work BunkhouseThe Bunkhouse & Farmhouse group accommodation at Llangorse Multi Activity Centre is located just 1 mile from Llangorse and six miles from the market town of Brecon. It is at the heart of the Brecon Beacons National Park and has stunning views over Llangorse Lake and the Brecon Beacons beyond. Together, the self-catering bunkhouses provide ideal accommodation for groups of up to 48, or they can be booked individually for groups of up to 24. 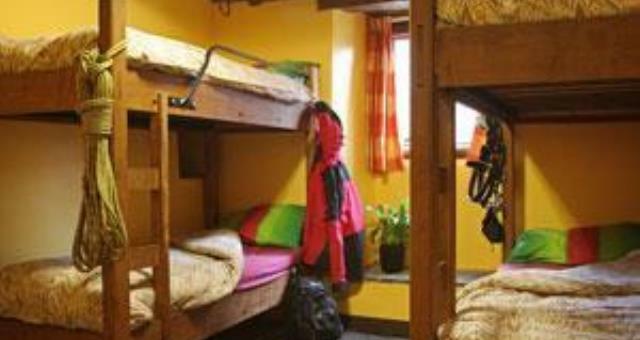 The accommodation is located near the Activity Centre which provides Indoor Rock Climbing, Indoor Activities, Horse Riding, Aerial Zip Line Tours, Outside Challenge Courses, and much more! Due to its location in the national park, the accommodation is also an ideal base for large groups and families who want to explore what the area has to offer, including walking, cycling, water sports, etc. The bunkhouse is part of a 12th century traditional farmhouse and provides ideal accommodation for groups of up to 24 people. There is a four bedded room on the ground floor. Six, eight and four bedded rooms on the first floor, and a two bedded room on the top floor. Four extra people can be accommodated if they bring their own camp-beds or air beds. The large oak dining table in the kitchen will seat 14 in comfort. The Farmhouse is a 13th century building adjoining the original 12th century house. 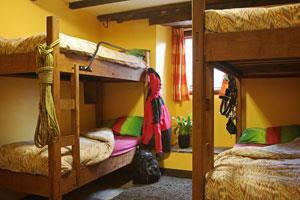 It provides accommodation for up to 24 people. All bedrooms are on the first floor, and each sleeps six people. Four extra people can be accommodated if they bring their own camp-beds or air beds. There are two oak dining tables - one in the kitchen and the second in an adjoining oak panelled room, which seat up to 24 people. Each bunkhouse has three washrooms fitted with a toilet, wash basin with shaver point and electric shower. Each kitchen is equipped with two electric ovens, a microwave, large grill, refrigerator and freezer. All crockery, cutlery and cookware is provided. During the summer months groups may like to use the barbecue and picnic tables outside. Both the Bunkhouse and Farmhouse are centrally heated in the winter and open all year. You will need to bring - food, bedding (pillow, sleeping bag/duvet, sheet), towels and tea towels. If you wish to place orders for milk or eggs to be delivered by the local milkman, please let us know a week before you arrive. Both Tesco and ASDA provide an online delivery service in the area. An informal camping area is also available near the Bunkhouses, which can provide additional options for larger groups. The Bunkhouse & Farmhouse group accommodation at Llangorse Multi Activity Centre is located just 1 mile from Llangorse and six miles from the market town of Brecon. It is at the heart of the Brecon Beacons National Park and has stunning views over Llangorse Lake and the Brecon Beacons beyond. Together, the self-catering bunkhouses provide ideal accommodation for groups of up to 48, or they can be booked individually for groups of up to 24.